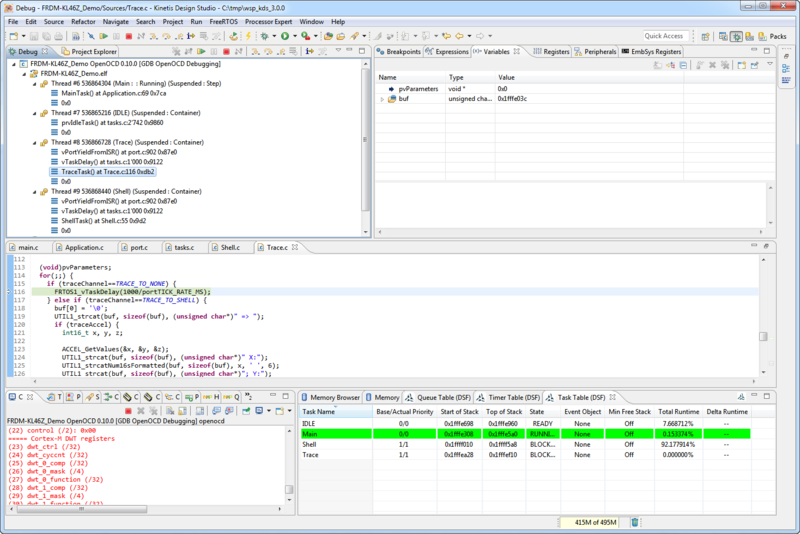 I wrote in “DIY Free Toolchain for Kinetis: Part 5 – FreeRTOS Eclipse Kernel Awareness with GDB” how to add task list and other views to Eclipse which is very useful. Still, it is not possible to switch easily between FreeRTOS threads. 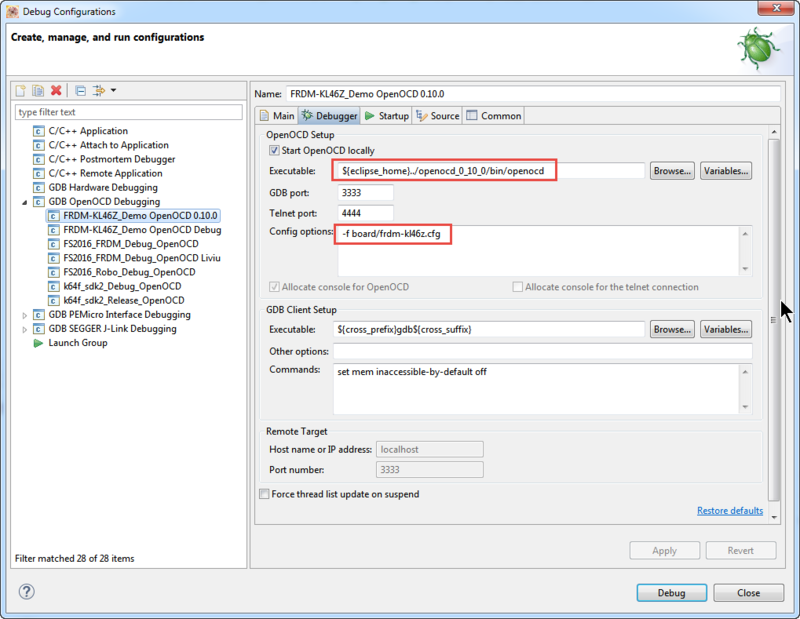 Then I wrote in “FreeRTOS ARM Thread Debugging with Eclipse and GDB” how to use GDB scripts at least manually between threads. Still ok, but not very usesr friendly. I have used the binary files with the installer. Then run the installer. There are multiple ways how to configure the path to the OpenOCD binary, see http://gnuarmeclipse.github.io/debug/openocd/ for details. For the RTOS support in OpenOCD to work, the OpenOCD needs to know about RTOS symbols. Earlier versions of FreeRTOS had this symbol defined. So either add a helper file to your application (see https://github.com/arduino/OpenOCD/blob/master/contrib/rtos-helpers/FreeRTOS-openocd.c) or use the FreeRTOS I have released a few days ago. This release includes that symbol defined. With using OpenOCD I’m now able to do FreeRTOS thread debugging with GDB and Eclipse. I’m not very happy with the stability and speed of OpenOCD: both P&E and Segger are much faster and stable solutions. But they do not (yet?) provide that thread feature. I can switch back and forth the debugging connection, but long-term this is kind of painful. So I hope that professional debug solutions would pick that feature up to make me and many others happy :-). 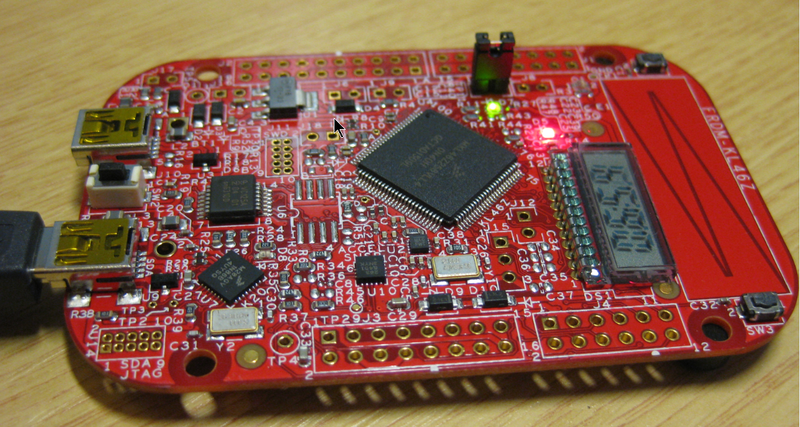 This entry was posted in ARM, Boards, CPU's, Debugging, Eclipse, Embedded, Freescale, KDS, Kinetis, KL46Z Freedom Board, NXP, Tips & Tricks and tagged arm gcc, Debugging, Eclipse, freedom board, FreeRTOS, Freescale, gnu gcc, KL46Z Freedom Board, open source projects, OpenOCD, OpenSDA, software, software project, technology, Tips&Tricks by Erich Styger. Bookmark the permalink. The thing I love most about this post, is the mention of OpenOCD. I don’t know why its reported as not stable most of the time by users, some iterations of openOCD were more stable than others in my experience, and its hard to understand why later versions don’t maintain the stability of older versions. If it was as stable as P&E it would be the best. I only use OpenOCD with the TWR-K60N512 for introductory lab, osbdm interface seems stable, and FRDM-KL25Z cmsis-dap, other boards like the FRDM-K64F are quite unhappy with it. I don’t know why. Thanks for sharing. Unfortunately, it is not only the stability of OpenOCD which bothers me: it is as well the download/flash programming speed. I mean a speed of 1-2 kByte per second is only ok for very small programs. But the programs the students have to develop and download are in the range of 120-180 kByte. It is a huge waste of time to wait always several minutes until you can start debugging. My measurement shows that openOCD is about 10 times slower than the solutions of P&E and Segger, that alone makes OpenOCD not attractive. The other thing is that frequently it fails connecting, but that’s maybe more of a problem of the configuration files (I need to write a post about this, as well inspired by a comment you made earlier on that, but I have run into that again recently). The other challenge maybe related to what you say: not every device is supported, and there is some luck behind it if a device works or does not work. Not sure why. The other thing is that OpenOCD seems very monolithic to me: you need to rebuild the binaries, and not everyone (especially on Windows) want and can do this. 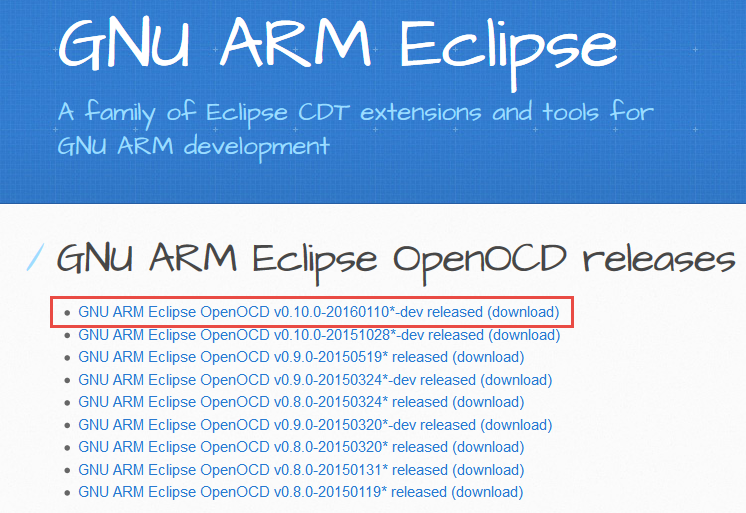 Lukily there are binary provides like Liviu (GNU ARM Eclipse) which makes it easier to use OpenOCD for the Windows world. I hear good and bad things about pyOCD too, while it seems to be more on the positive side. But as long as there is not place where I can go and get the binaries, I won’t use it in my classes: the P&E and Segger solutions are free of charge too with OpenOCD, stable, reliable, fast and support all the devices. And personally I rather spend the $50-60 for a Segger EDU than wasting my time with something else. I feel sad for the efforts the OpenOCD community does on this project. The 0.8.0 which is in KDS v2.x and KDS v3.x works reasonable for some boards e.g. the FRDM-KL25Z and FRDM-K64F, but mostly fails on anything else. I tried a while back the 0.9.0 and it was a huge step back in my view, pretty much nothing seemed to work. Now with the 0.10.0 things seem to recover again, but still it is very, very slow. Good for experimenting with it, but not for daily usage. I’m wondering if this is only true for NXP parts, as it seems that for STM parts the support seems to be better with OpenOCD. I also realized the same, for other silicon vendors, support seems better. May be we need one of us to join the bandwagon and push some changes for programming Kinetis ( and other NxP) devices. I didn’t know version 0.10.0 is out… will test on Linux. meanwhile, I read this: https://sourceforge.net/p/openocd/mailman/message/28952546/. It could be the reason it works relatively better on TWRK60. Fragmentation problems in openOCD, we need someone taking a look at the NxP device support. Maybe it’s worth mentioning, that it’s not possible to use Segger SystemView when a OpenOCD session is running. This is a major downside, too. yes, this is true: if using OpenOCD, then all the good Segger things like the SystemView are not operational. It seems that only four ‘threads’ appear even though I have more than that running. Selection seems random. Anyone else experience this? Regarding modifying of the upstream configs, you do not really need to because you can add $_TARGETNAME configure -rtos auto to the end of your openocd.cfg or to the command line via -c parameter (just make sure it comes after sourcing of the target config). Regarding speed, 0.8.0 had a really very slow CMSIS-DAP driver but it was basically rewritten since then and the speed should be about as fast as it can get. Regarding regressions and stability, 0.9.0 got very positive feedback, so I’m unsure what exactly do you have in mind. Please do report the issues you face to the bugtracker or to the devel mailing list! The majority of OpenOCD developers do not use Kinetis parts so it’s not getting tested “automatically”, the project depends a lot on the feedback and contributions from the community. One question would go to Freescale: why did they fork OpenOCD instead of contributing nice code upstream?.. Please feel free to test 0.10.0-rc1, J-Link users will find SWO support and there were plenty of other good changes. If you face any regressions, please report! thanks for pointing out the 0.10.0 release candidate! thank you! I have updated the two links. Si vous utilisez FreeRTOS et que votre IDE est Eclipse et que vous vous connectez à votre carte grâce à OpenOCD, ceci devrait vous intéresser ! Which version of OpenOCD are you using? 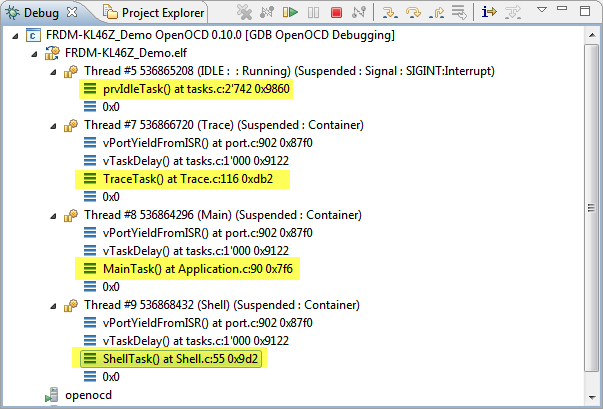 It looks like OpenOCD does not correctly identify the task descriptor and its fields. I have seen many of these problems with OpenOCD and that’s why I pretty much not use it any more, and using P&E and SEGGER instead which works fine. I believe this would have to be reported to the OpenOCD community.